UPDATE: After looking at the weather outlook for Wednesday, with a forecasted 6 to 12 inches of snow and blizzard-like conditions for the NY metropolitan area, we’ve decided to postpone the RHIC/LHC trip to Brookhaven Lab. If the snow predictions hold true, roads between here and the city could become pretty treacherous and the Lab likely will closed for all or part of the day. We apologize for the inconvenience. The good news is that we’re planning to reschedule the trip sometime within the next month, when the LHC will be even closer to producing its first high-energy collisions. We’ll let you know as soon as we have a new date. Science Writers in New York (SWINY) and the U.S. Department of Energy’s Brookhaven National Laboratory (BNL) invite you to tour BNL’s Relativistic Heavy Ion Collider (RHIC), the world’s largest atom smasher designed exclusively for nuclear physics research. Reporters will also be able to interact via a live feed with physicists across the Atlantic as they gear up for related explorations of the inner workings of the early universe at CERN’s Large Hadron Collider (LHC). Physicists from both facilities will explain how accelerators work and how the two machines complement one another, and elaborate on the different goals of RHIC and the LHC. Wednesday, February 10, 2010, starting at 10:00 a.m.
Brookhaven National Laboratory — on William Floyd Parkway, one-and-a-half miles north of Exit 68 of the Long Island Expressway, Upton, New York. If at least 10 reporters sign up, Brookhaven Lab will supply a charter bus to leave New York City at 8:30 a.m., promptly, returning to NYC after the event. RHIC is a 2.4-mile-circumference particle accelerator that collides gold ions moving at nearly the speed of light to recreate the conditions of the early universe and explore the fundamental properties and interactions of matter. Reporters will tour the RHIC control room and two large detectors, STAR and PHENIX, which analyze thousands of particles streaming from these collisions to help scientists get a better understanding of the strong force that holds protons and neutrons — and everything in the universe — together. The group will also interact via live feed with physicists at CERN, the European laboratory for particle physics. If we’re lucky, the very first high-energy proton collisions will be taking place at the LHC, now the world’s largest and most powerful particle accelerator. 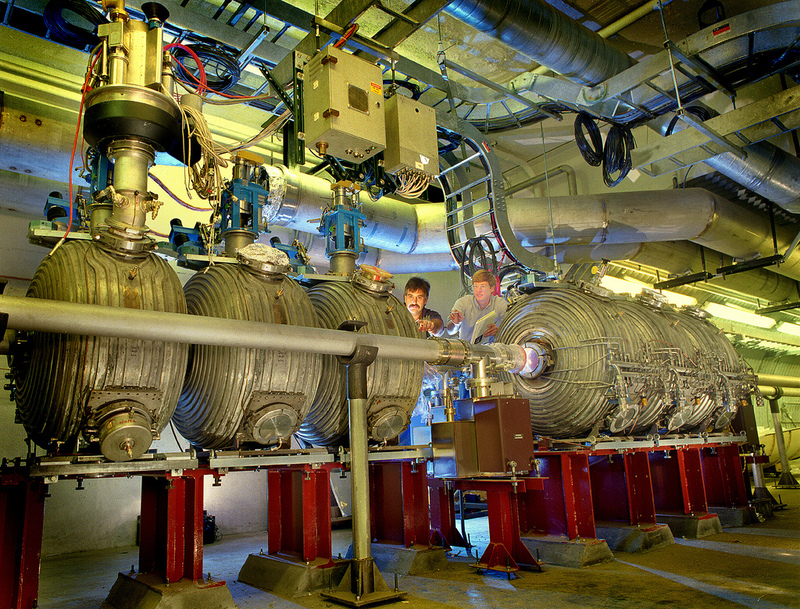 Brookhaven played a pivotal role in the design and construction of one of LHC’s large detectors, known as ATLAS, and serves as the host laboratory for the U.S. ATLAS collaboration. During the tour, we’ll also visit the RHIC/ATLAS computing facility (RACF), which stores, distributes, and analyzes vast amounts of data from both facilities.